Insult Swordfighting: Spec Ops: The Line or K-Cup? 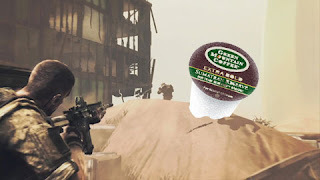 Spec Ops: The Line or K-Cup? One of these quotes is from IGN, as seen in the launch trailer for Spec Ops: The Line. The rest are descriptions of K-Cups available for purchase at Keurig.com. Can you figure out which quote doesn't belong? "Spellbinding complexity... deep, dark, and intense." "Not for the faint of heart...intense and uncompromising." "Raw energy in its purest form." If you guessed #5, "Intense and unique," you are correct. Bonus points if a cup of single-serve coffee has ever set your brain on fire. Perfect. This is my favorite kind of post. i like your blog. i'll be following it.